AiPT! Staff Picks – January 2018 – AiPT! It’s a new year, full of new comics, movies, games and everything else, you, our devoted audience loves just as much as we do! But maybe you’re starting 2018 with an open mind, looking for a few recommendations. If that sounds like you, then you’re in the right place, as AiPT! 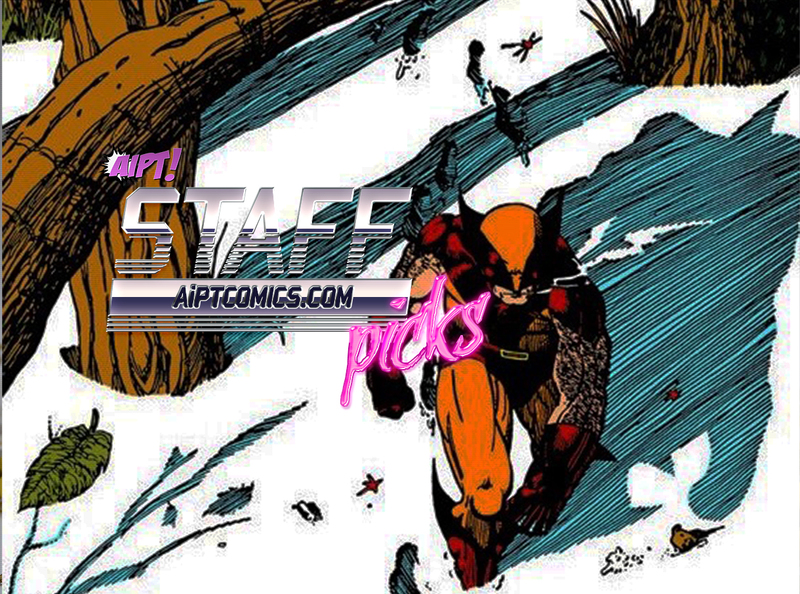 Staff Picks has got your back. This month, Editor-at-Large Chris Hassan and AiPT! Podcast and new Toy Editor David Hildebrand share their pop culture picks! Favorite current comic series: It’s a good thing I’m answering this question in the last week of January, because my “favorite current comic series,” Phoenix Resurrection: The Return of Jean Grey, concludes this Wednesday! I’m one of those X-Men fans who would have preferred if Grant Morrison hadn’t killed Jean off (again). So to finally have her back (again), in such a well-written miniseries courtesy of Matthew Rosenberg is just all-around awesome. Also, this comic is just plain good X-Men. Favorite current TV series: I know we’re living in a “Golden Age” of television, but I just don’t have much time to watch shows on a regular basis. I tend to catch up later via streaming. For instance, I’m almost done watching all of Comedy Bang! Bang! With that said, I’m glad Real Time with Bill Maher is back to knock some sense into people (on both sides of the political spectrum) and I do like to start my day with Morning Joe. Last great movie you saw: The last movie I saw was actually pretty great–Brigsby Bear, starring SNL’s Kyle Mooney and Luke Skywalker himself, Mark Hamill. I didn’t know much about this film going into it, and it made for a far more enjoyable experience. And I’d be lying if I said the ending didn’t get to me. I also just got my MoviePass card and I’m looking forward to finally seeing all those award season movies. Current gaming addiction: I don’t play video games, so I guess my answer is life. I’m addicted to the game that is life. Band(s) you’ve been listening to: I always say, the older I get, the harder it is to keep up with comics, TV, movies, etc. Music is definitely in the mix. But Spotify has made it easier for me to discover new music. I play the “Discover Weekly” playlist regularly, then add songs I like to my main playlist, which gets pretty random. Just looking at it, The Zombies, Justin Timberlake, 10cc, George Harrison, The Bobbettes and Taylor Swift are all recent additions. With new comic titles being announced, which ones are you looking forward to? I’m a monthly Marvel guy, so the only DC series I make an exception for is Batman. But I’ll be honest, I’m interested in picking up The Terrifics. Jeff Lemire does the Fantastic Four… sounds pretty cool to me. Also, X-Men Red, of course. While the team looks questionable, and I’ve never read anything written by Tom Taylor, I’m just happy to have Jean Grey back in the Marvel Universe. Now, where’s Cyclops? Since we’re closing out January, what are you looking forward to in February? X-Men Red #1, on sale February 7. Black Panther, in theaters February 16. Also, we’re one month closer to spring. This winter’s been rough. Favorite current comic series: My backlog of comics is more than insane! I read more for AiPT! than anything else. I did sit down a couple of weeks ago and caught up on Tom King’s Batman run. I have enjoyed it so far! Another series is Postal. The last issue came out last week, and I haven’t touched any issues of this final arc. I want to sit down and read it all at once, so that is next on my list. Favorite current TV series: I am not a big television show guy. I know there are many shows out there that are REALLY good, but I am a movie/sports guy for the most part. I did watch the first season of Riverdale. I was shocked that I liked it! I need to catch up on the second season. Other than that, I faithfully wake up early Saturday and Sundays to watch soccer. Glory, Glory, Man United! Last great movie you saw: Mother! is easily one of the better films I have seen lately. There is a split right down the middle of people that liked and hated it. You have to be familiar with Darren Aronofsky to appreciate it. His plots are out there with a lot of symbolism. If you are looking for something different and willing to have an open mind about the film; ignore the haters and give it a watch. Current gaming addiction: PUBG! PUBG! PUBG! PlayersUnknown Battlegrounds. I am late to the party because I have an X-Box, but now I can’t stop playing! If you listen to the AiPT! Podcast, (shame on you if you don’t) then you know the game pissed me off bad, and I uninstalled it. Well, they have had a few updates, and the game runs better now. Band(s) you’ve been listening to: I’m a huge metal fan. The Dillinger Escape Plan is one of my favorite bands. They played their final shows this past December. It was unfortunate that I didn’t get to make it to New York to catch one them, but there are playlists on Spotify of the final shows. I have been listening to those. Coolest recent purchase: This isn’t really in the realm of nerdom. More like being an actual adult. I picked up a SodaStream. It’s a machine that makes sparkling water and soda. I am doing my best to cut real soda out of my life and I got this in hopes that it will work. I was skeptical, but happy to say that it has a good taste and does the job! With new comic titles being announced, which ones are you looking forward to? There are a couple series that I am looking forward to. The first one is Damnation: Johnny Blaze Ghost Rider #1. I never liked that “Ghost Driver” madness; I need Johnny Blaze! Christopher Sebela is teaming up with artist Phil Noto, so I have hopes that Ghost Rider will be good! And I am a fan of Gail Simone, so I am looking forward to her take on Domino. Since we’re closing out January, what are you looking forward to in February? I haven’t really looked ahead to February. I am looking forward to Black Panther and I am looking forward to catching up on a lot of reading. I have two autobiographies sitting here that are begging to be read. I have to step it up! Those are our picks–let us know what yours are in the comment space below!